Size o this luikower: 390 × 599 pixels. Ither resolutions: 156 × 240 pixels | 312 × 480 pixels | 391 × 600 pixels | 500 × 768 pixels | 667 × 1,024 pixels | 2,110 × 3,240 pixels. 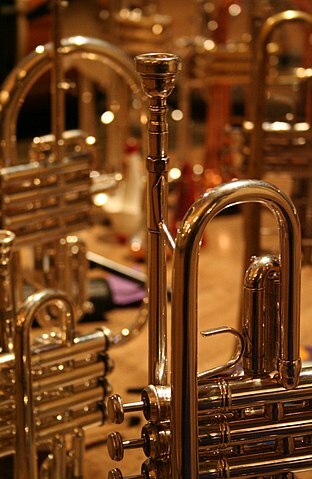 English: A trumpet, foreground, a piccolo trumpet behind, and a flugelhorn in background. Soorce No machine-readable source provided. Own work assumed (based on copyright claims). Author No machine-readable author provided. Miskatonic assumed (based on copyright claims).